The Giza Plateau, the site of the mysterious Great Pyramid, the Sphinx and thousands of tombs, has attracted more tourists, archeologists, historians, scientists and mathematicians than any other. 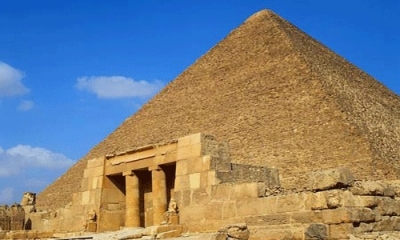 The Great Pyramid (Pyramid of Khufu or Pyramid of Cheops) is the oldest and biggest. One of the Seven Wonders of the Ancient World, it houses the body of Pharaoh Khufu and was built with more than 2 million stones over a period of 20 years. The complex and elaborate funeral customs of ancient Egyptians were believed to ensure immortality in the afterlife. The Valley of the Kings, a World Heritage Site, is known to contain more than 60 tombs and 120 chambers. It was the main burial place of the major royal figures of the Egyptian New Kingdom. The fascinating tombs of Egyptian pharaohs are still being discovered to this day.